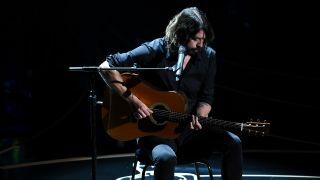 Dave Grohl performed Blackbird by the Beatles during the In Memoriam segment of the Oscars ceremony at the Dolby Theatre, Hollywood, last night. The Foo Fighters frontman paid tribute to stars such as Wes Craven, Alan Rickman, Christopher Lee, Leonard Nimoy, Holly Woodlawn and David Bowie, who have all died since the 2015 ceremony. Earlier this month, Grammys producer Ken Ehrlich admitted that Grohl had pushed for the Lemmy tribute at that awards ceremony this year. Foo Fighters’ documentary series Sonic Highways won Film Of The Year at the 2015 Classic Rock Awards in December.